flute of Champagne is a task that the Champenoise viticulturists do not undertake lightly. The Champagne making process is referred to as the ‘Methode Champenoise’, a term now legally patented by the Champagne region, alongside Champagne itself. From around winter until summer, growers must attend carefully to their vines, in preparation for the oncoming season. The process involves pruning, ploughing, de-budding, trimming and trellising the vines, predominantly by hand. When summer comes, it is up to the weather to take good care of the crops. Whilst maintenance of the vines is still imperative, the weather plays the most decisive role in the quality of the yield, with viniculturalists all over Europe praying for adequate precipitation, warm temperatures and no extreme conditions. Then it comes to harvest, a period where the whole region swings into action. The dates of the harvest are set by CIVC (Comité Interprofessionnel du vin de Champagne) and each village must adhere to their designated dates. Manual picking remains the tradition in Champagne, as it is key to harvest whole bunches of undamaged grapes. When the time is right, pickers have roughly a three week window in which to work to ensure that the quality of the grapes is at its best. Around 120 000 pickers work in teams to pick, load, transport, press and store the infinite litres of juice. This is a crucial and delicate time in the process and the lead time between the two must be kept to a minimum. Why? Because the longer the grapes are left, the higher the risk of maceration occurring. What is maceration? Maceration is when the tannins and colouring agents are leached from the skin, the seeds and the stalks of the grape into the must. This is highly undesirable in Champagne as it can discolour the juice. As two thirds of the yield in Champagne are black grapes, it is essential that the grapes are handled delicately and pressed gently to avoid any discoloration. After pressing, the juice is left to cool and settle. This is also known as the alcoholic fermentation, from grape must to wine. The yeast consumes the natural sugars in the juice, producing alcohol and other by-products, including carbon dioxide and heat, which escapes out of the container. This part of the process is conducted most commonly in stainless steel vats, and more rarely in wooden barrels. The alcoholic fermentation lasts about a fortnight and is monitored on a daily basis, checking temperature levels and overall conditions of the fermenting musts. who have a necessity to create a Champagne with consistent taste and quality. It is a true talent that relies on sensory memory, expert experience and creativity. The winemaker/cellar master blends base wines from different grape varieties, different crus (winery villages) and different years, to achieve a blend that reflects the personality of the maker and House. It is a long and arduous process and can take several weeks bench-testing multiple combinations, before assembling a definitive blend. Once a blend has been decided on, it is bottled and stored in the cellars, ready for the most magical stage of the process. Also known as la prise de mousse, this is where our beautifully blended base wine becomes effervescent Champagne. The process is initiated by adding the ‘liqueur de tirage’, a solution made up of reserve wine, sugar and yeast cultures. This stage of the fermentation process can start as late as the following January after the harvest. It takes six to eight weeks and the wines must be kept at a relatively constant temperature of 12 degrees Celsius. During the process the yeast continues to consume the sugar, producing carbon dioxide as a by-product. The carbon dioxide becomes trapped in the bottle and this ladies and gentlemen is how we get our bubbles! Continue your discovery of Champagne, learning about the various grape varieties which make up this bubbly favourite! As the second fermentation comes to an end, all of the sugars have been consumed, the yeast eventually dies and decomposes. The wine continues to develop even after the yeast has died and the lees (yeast deposit) begins to mature over time. The maturation of the lees is key to inspiring those deep and complex aromas quintessential of a good Champagne. 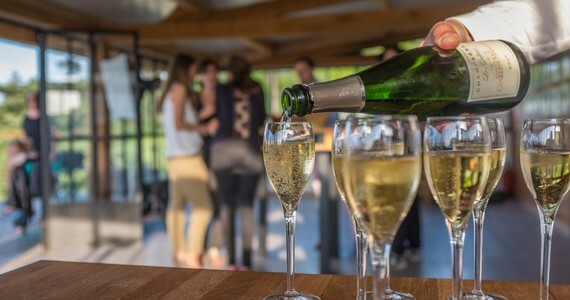 All Champagne must spend a minimum of 15 months in the bottle, which is much longer than any other wine region, which usually require just 90 days for a sparkling wine. Most producers will allow their Champagnes to mature for two to three years and even longer for a vintage (minimum requirement is three years). 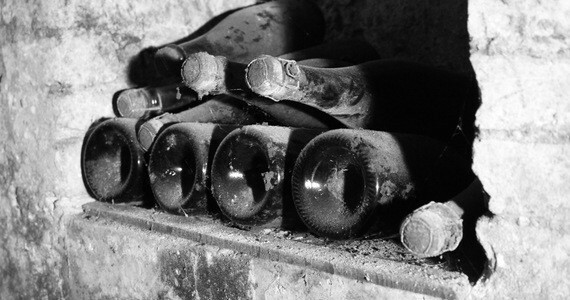 Towards the end of the maturation period, the dead yeast and other sediment must be removed from the bottle, as it doesn’t make for very pleasant drinking. This is achieved through a process of riddling (remuage en Français). It is an age-old technique mastered over time and is a skill often passed down through generations. Riddling involves systematically twisting the bottles, until the bottle is vertically placed in the pupitre, gradually coxing the sediment into the neck of the bottle. A good ‘Remuer’ can turn roughly 40 000 bottles a day and the process takes approximately four to six weeks. Nowadays, machinery is also used to simulate the same riddling process. Large ‘gyropalattes’ are used and can turn up to 500 bottles in one go. This reduces the process time down to a week, at no expense to the quality. Disgorgement is the process of removing the sediment from the neck of the bottle. Previously done by hand (dégorgement a la volée), it is now done by machinery. The bottle neck is plunged into a refrigerating solution at minus twenty-something degrees Celsius. This freezes the neck of the bottle, trapping the sediment in an ice cube. The cap of the bottle is then released and the pressure inside the bottle expels the frozen matter out of the bottle. A machine adds a final shot of sugar, most commonly known as “dosage” or “liqueur d’expéditon”, which determines the sweetness of the Champagne (brut, sec, demi-sec) and then finishes the bottle with a cork and muselet. After the disgorgement process, the bottles are then washed, labelled and boxed, ready to be shipped out and enjoyed. Champagne is adored worldwide and around 45% of production is exported. The biggest importer of Champagne is the United Kingdom, purchasing on average over 30 million bottles per year. 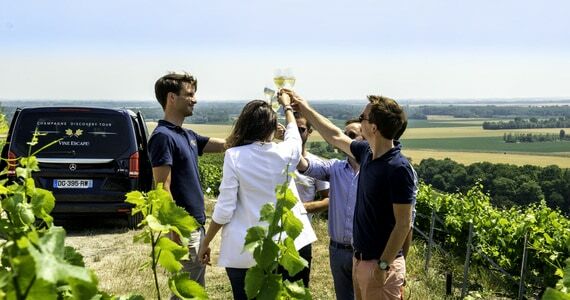 Many of the big producers will supply their bottles to establishments directly or some will use an importer, however there are still thousands upon thousands of undiscovered smaller producers in France that have no established channels of exporting their Champagnes…. And a Grape Escapes adventure will put you in touch with a handful of these producers, providing you with the unique opportunity to taste and perhaps even purchase some of their secret Champagnes.